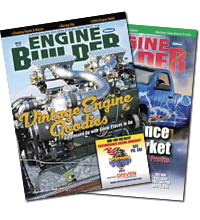 Engine Builder Magazine periodically takes a survey of labor costs for rebuilding a particular engine. This survey is on the popular Chevrolet 262 V6. We’re asking specifically about the 262 cid engine produced PRIOR to the 2014 debut of the EcoTec 4.3L V6. Your survey responses will be completely anonymous. Results of this survey will be reported by multi-state regions only, and will be printed in the February 2019 issue of Engine Builder. The results should be a valuable benchmark to you in determining your competitiveness. At the end of the survey, you can enter your name for a chance to win one of 10 gift cards worth $25, picked from a selection of retailers. Can’t finish the survey all at once? Your answers are saved after you complete a page. Come back later, and you will be taken to the spot where you left.